Happy Wednesday, everyone! It's been a while since I last posted, huh? Well, it's spring here in western NY and that means I'm busy busy busy. I had lots of garden work to do to get things ready for the planting season, not just in my own garden but also in my mom's garden since she's unable to do most of it herself. I also had to work on her front yard where she had a pipe replaced earlier this year. Have you ever had that kind of work done? Let me tell you, the ROCKS you have to deal with is unreal! I had to rake about 5 wheelbarrows full of rocks out of her front yard! My mom has been having a blast using those rocks to decorate and pave her back yard, and she still has a huge pile left. I've also been going through our pantry and freezers, getting space ready for the season. I canned up a bunch of beef that was in our freezer from last year to make room for the new 1/4 cow we'll be buying shortly, and then I canned up all sorts of jam to get some fruit out of the freezer from last year. I made some wine with leftover pear juice I had from an overabundance of years my MIL's pear tree produced last year. It's been a very busy spring! Thankfully, the hardest parts of spring/summer are over now. 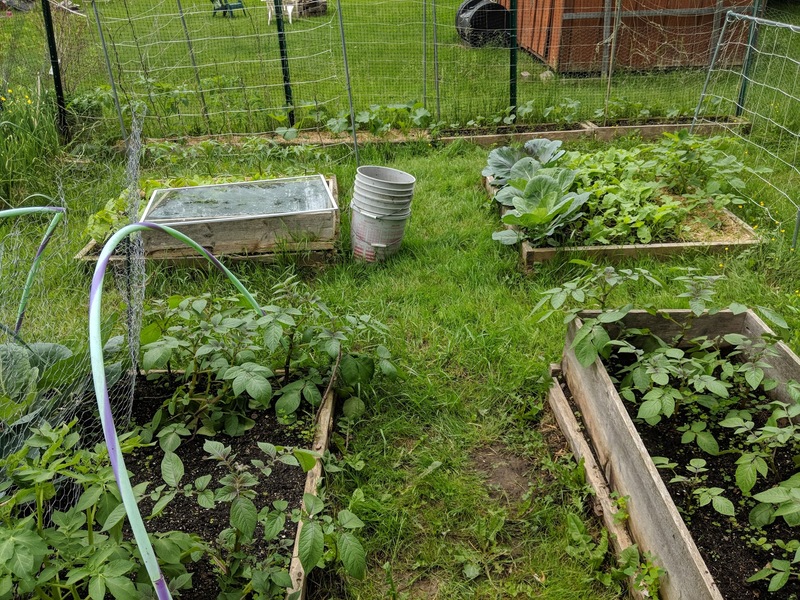 The garden is going great, and now it just needs watered and fertilized once in a while. The majority of the spring canning is done. 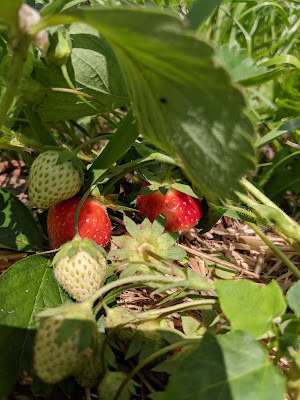 I have to make some more strawberry jam and a batch or two of blueberry jam (from last year's blueberries), and I'm thinking about canning another batch of chili with the six pounds of ground beef left from last year. My mom's front yard is all raked and grass seed is starting to come up! Phew. Now I can finally get back to blogging and designing PC designs, which is what I really want to do! Here's some pictures of my life lately. 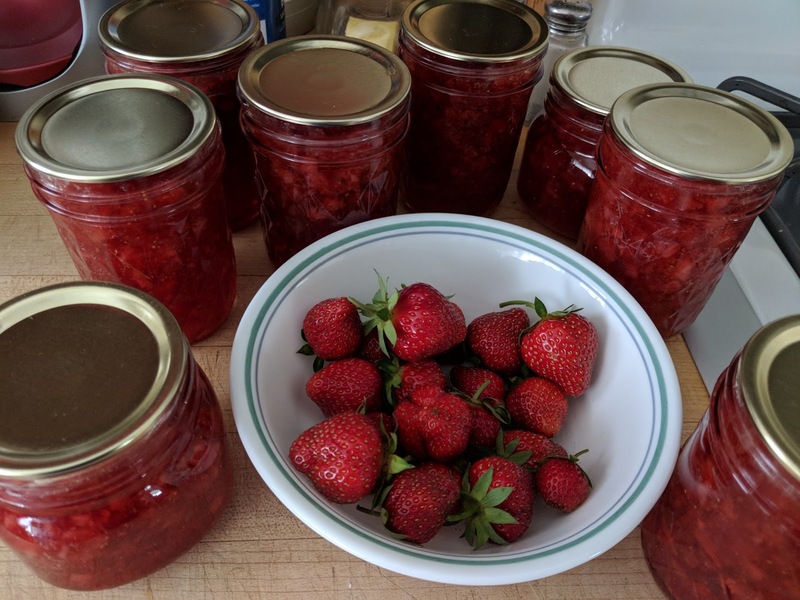 I canned up some strawberry jam on Monday this week. I've been making lots of jam to give away as Christmas presents this year. I have an overabundance of half pint jars and wouldn't mind getting rid of some of them! 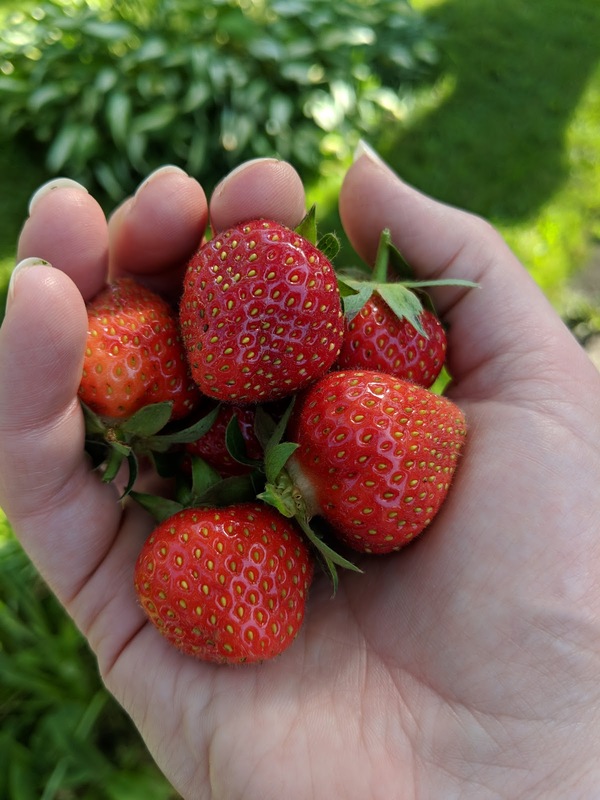 I've been getting some strawberries from my garden the last few days! 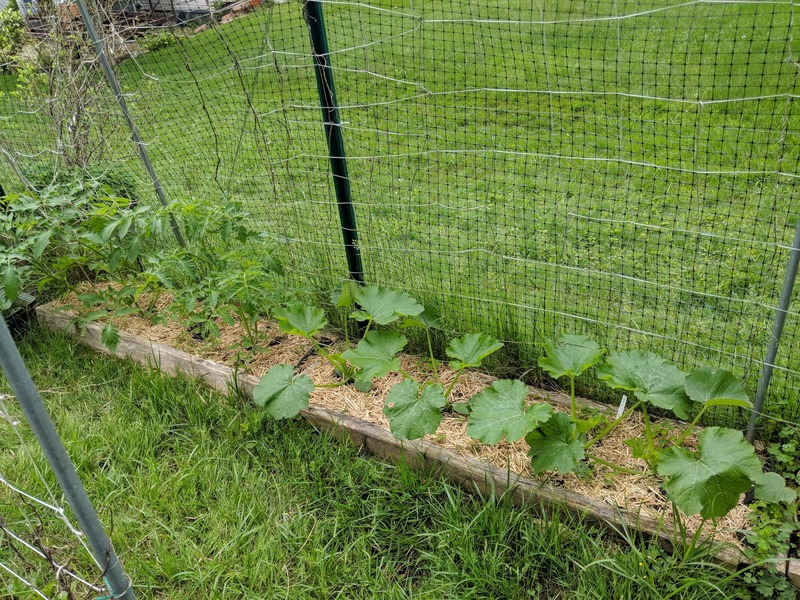 Boy, they're really producing like crazy this year. I have a lovely flower garden behind my garage that's just starting to bloom. 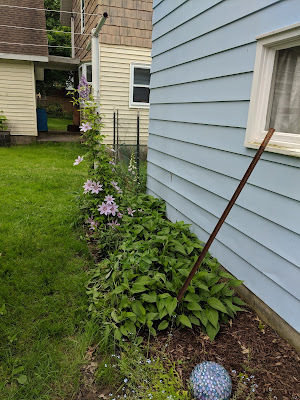 The clematis did great this year, although it has been nipped by the deer since I took that picture. Most of the rest of those flowers are black eyed Susans. I planted them as a remembrance of my favorite aunt when she died, and they have since taken over my garden. I think that's very cool! This is kind of a bad picture because the fence is in the way, but here's my small side garden. 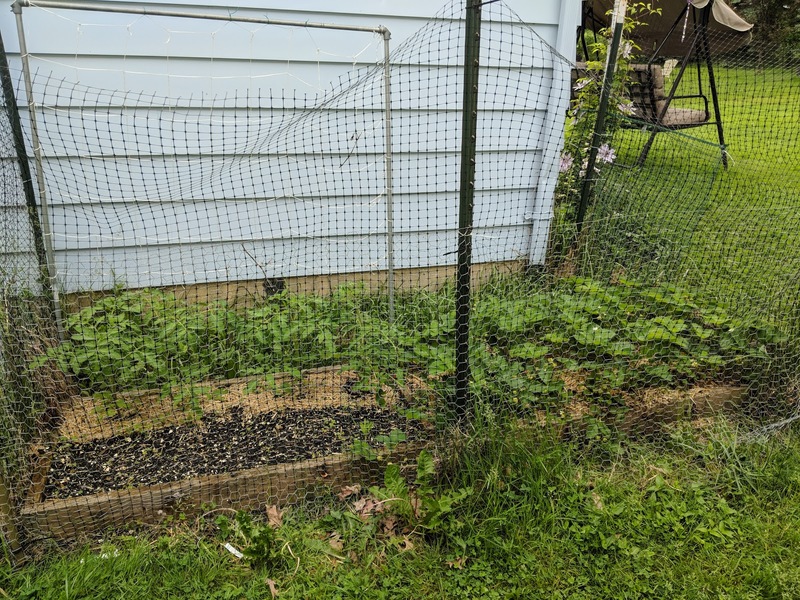 The left side is tomatoes and carrots this year, and the right side is my strawberry bed. This is my mini greenhouse where I grow peppers. 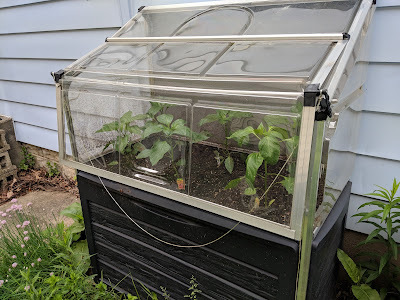 It's literally the only way I can get peppers to ripen in my garden. It works great! 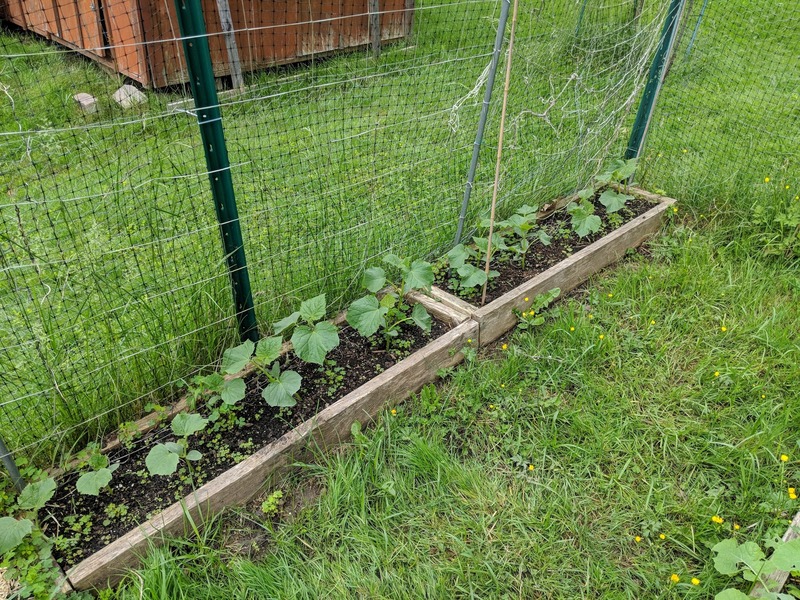 I've had it for three years now and I've gotten so many pepper using it, plus it's a great way to start my cucumbers and zucchinis early. And here are my cucumbers! I actually took these pictures last week, and they're literally twice as tall now. They're just zooming. 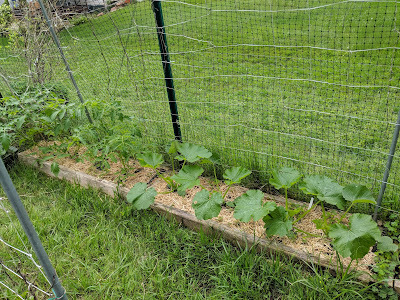 Here's some zucchini and tomatoes. They too are twice as tall as they were last week. 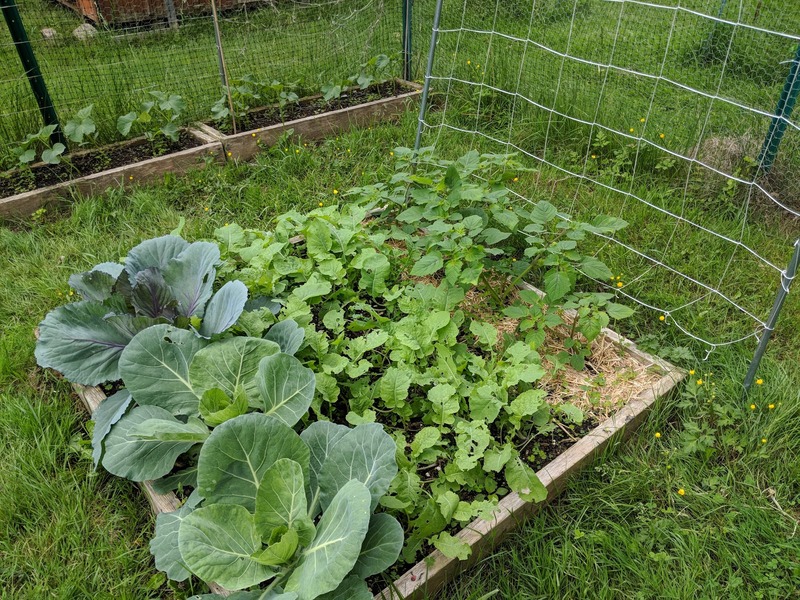 I'm especially proud of my cabbage so far this year. Again, this was a week ago and they're now so much bigger than they were in this picture. I have had such trouble growing cabbage in the past, but look at how nice they are! The rest of the box is full of rutabagas and ground cherries. 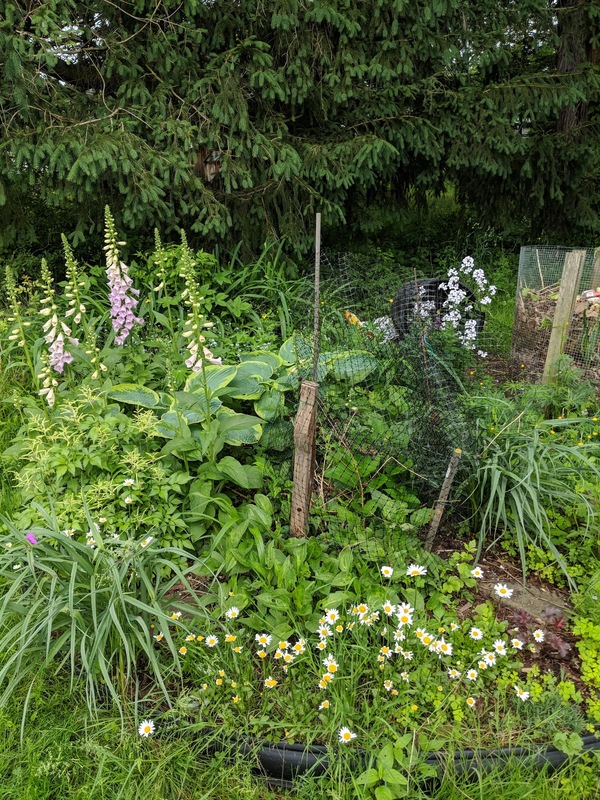 Here's a side view of the garden. That's potatoes on both sides on the bottom of the picture. They're blue potatoes and I'm so excited to harvest them! 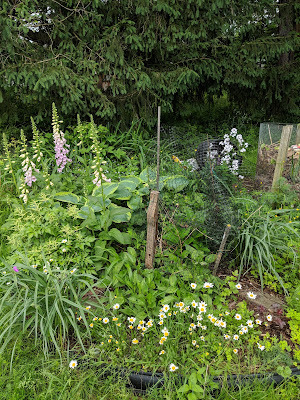 I have a shade garden in the very back of my yard. This picture doesn't do it any justice at all. It's very lush and had a pretty wild look to it. The fencing in the middle is so that the deer don't eat the hydrangea, although someone really tried to last night! 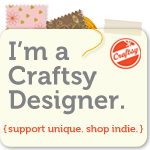 I have been working on designs too! This is my latest design, inspired by all the canning I've been doing lately. It's very nearly done now and I should be posting on Etsy sometime this week. Keep your eye out! I guess that's all for now. I have a lot of work to catch up on, but I hope to be posting on my blog more regularly now that I have less going on in my life! Hope you're all having a great week! 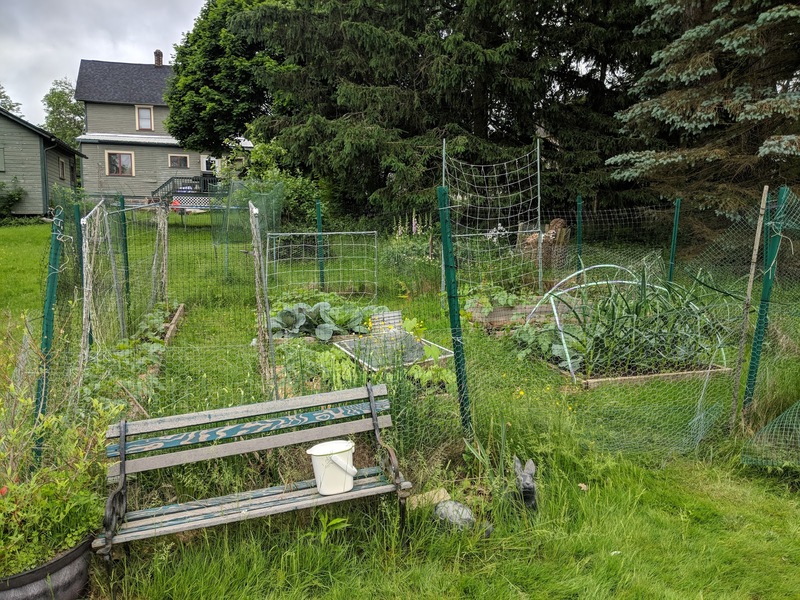 What a wonderful garden you have! Boy, have you had your hands full! So much work done! 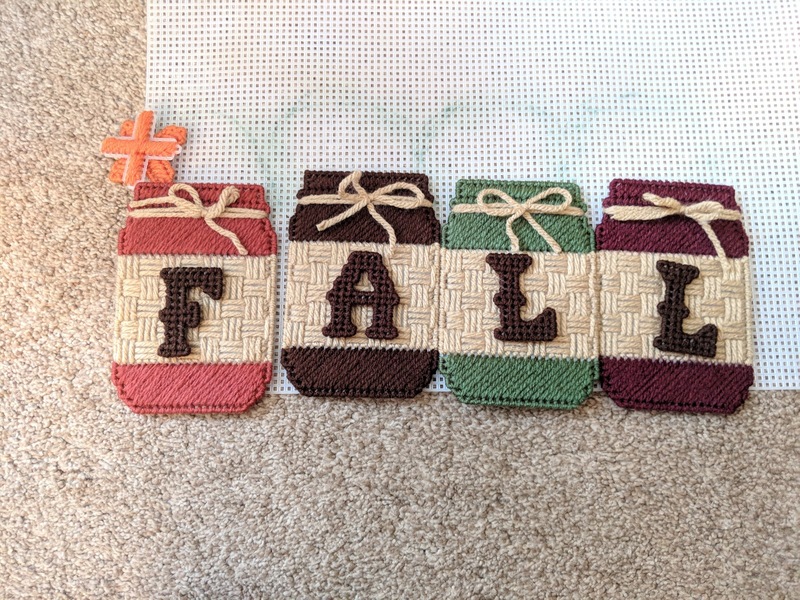 I love your fall jars in plastic canvas :) they're pretty! Thanks for the nice compliments :) It's nice to hear from you after being gone for so long! I hope you're doing well!